Whether you need a robust commercial concrete floor system or you want to finish your basement on a budget, you can count on American Dynamic Coatings for professional epoxy flooring results that exceed your expectations. Fill out this form and someone from our team will reach out to you shortly. Ohio concrete business specializing in concrete coatings and resurfacing solutions. We serve residential and commercial clients with full-service concrete solutions to give your existing concrete new color, texture, and performance. One of our most popular services is epoxy flooring, a versatile and robust floor system with limitless design options. 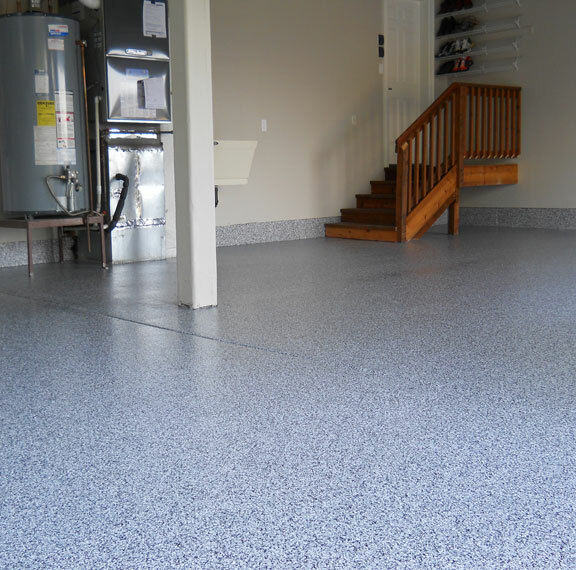 Epoxy is popular among homeowners in the garage and basement where it delivers great performance for up to 20 years with beautiful options like colorful granite flake and metallic epoxy designs. Epoxy is also durable enough for demanding commercial and industrial conditions, even in environments with specific sanitation concerns or chemical resistance. We also install rubber concrete coatings and epoxy slurry systems for specialized protection of your concrete. American Dynamic Coatings can even make your concrete look like an entirely different material with wood stamped concrete and exterior coating products. With our patio and pool deck resurfacing, you can give your exterior concrete new life and brand-new texture and color without breaking the bank. You don’t need to settle for boring, gray concrete or high-maintenance wood. Stamped concrete that looks like wood is the perfect compromise, giving you the texture and rich color of wood with the strength and durability of concrete. Concrete that looks like wood in Dayton, OH can be used to create an interior concrete wood floor or it can be used outdoors for a patio or pool deck. This is one of the most popular ways to resurface a pool deck and give the appearance of a high-end material without the price tag or upkeep. To create concrete that looks like wood, our concrete contractors stain the concrete and stamp it with unique wood plank stamps before it sets. This gives the concrete the realistic color and texture of wood, complete with wood grain, plank lines, and even wood knots. 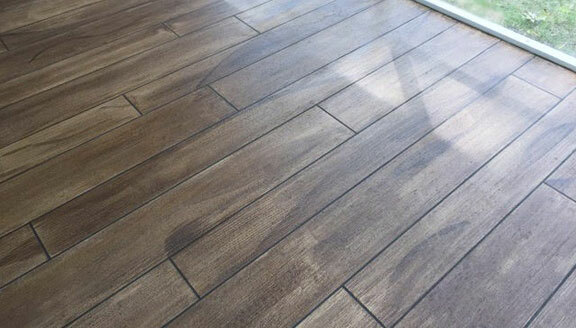 Stamped concrete that looks like wood can be achieved with freshly poured concrete or using a stamped concrete overlay. This involves applying a thin layer of concrete polymer to your existing concrete that’s stained and stamped as normal to give old concrete a brand new look. Concrete floor coatings in Dayton, Ohio offer a low-cost yet durable solution to protect existing concrete and give it a decorative new look. Our concrete coating contractors have years of experience working with all types of decorative concrete coatings, including rubberized concrete waterproof coatings and epoxy floor coatings that can be installed in residential and commercial settings. Garage epoxy coatings. Garage floor epoxy is a long-lasting solution to stop concrete dusting and give you a garage you’ll love to show off. It resists road salt, auto fluids, hot tires, and more with a beautiful decorative finish. Commercial concrete epoxy. Our Dayton commercial epoxy floor contractors serve all industries with robust, attractive floor systems. Commercial epoxy is strong enough for processing plants, warehouses, and breweries and withstands abuse in retail settings and medical facilities. Rubberized floor coating. Looking for a long-lasting and waterproof concrete coating? A rubber coating for concrete floors is perfect for a garage or industrial application thanks to its resistance to water, impact, extreme temperature, and chemicals. Epoxy slurry systems. This self-leveling concrete coating offers extreme protection for your concrete with industrial-grade impact, thermal shock, and chemical resistance with low odor. Slurry systems are made from 100% solids epoxy blended with slurry powder or graded silica for long-term protection. Basement epoxy coatings. You don’t need to live with a dark, musty, and dusty basement. Basement epoxy in Dayton delivers a finished, low-care, and waterproof floor system that instantly brightens your garage. Metallic epoxy floors. Want a show-stopping new look? A metallic epoxy floor coating in Dayton is a great choice for a garage, basement, lobby, or office building with a one-of-a-kind 3D effect and the look of smoke, lava, water, and more. Epoxy flake flooring. This popular type of epoxy floor coating incorporates your choice of color flakes broadcast over the surface. Also known as epoxy chip or granite flake epoxy, you can enjoy a subtle design with improved slip resistance in your garage or business. Whether you want to protect or revitalize your existing concrete, American Dynamic Coatings can help. We offer cost-effective concrete cleaning and sealing to protect your existing patio, driveway, pool deck, or interior concrete. Sealed concrete resists water to avoid cracks and damage from freeze-thaw cycles in Ohio. Concrete sealing also helps your concrete resist stains, spalling, and other issues while preserving the color in your stained concrete. We can also transform the appearance of existing concrete with a variety of resurfacing solutions. Concrete floor resurfacing in Dayton, Ohio may involve stains, concrete polishing, a stamped concrete overlay, or an epoxy floor coating depending on the look you want. Coatings and polishing can also protect your concrete floors against damage, moisture, and stains. For exterior concrete resurfacing, including pool deck resurfacing, we offer a range of options. The most basic option is a standard concrete resurfacer that makes your concrete look like new again. We can also apply an exterior concrete coating such as rubberized concrete coatings or acrylic coatings. For the most transformative look, consider a stamped concrete overlay to get the look of wood, pavers, brick, or slate at a fraction of the cost. Untreated concrete flooring presents many problems. It’s extremely porous which makes it prone to cracks and stains over time. This can also pose an environmental and safety concern in areas in which chemicals are handled. Regular concrete is also dusty and develops problems like spalling, not to mention its unattractive, dull appearance. Concrete grinding and polishing addresses these concerns by transforming concrete slabs into a colorful, reflective surface that’s not just attractive — it’s also less porous and more durable. 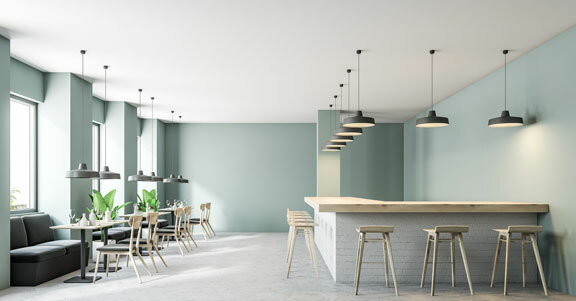 Polished concrete is popular in commercial and industrial properties, including bars, hotel lobbies, and grocery store,s with a huge range of design options. Because our concrete polishing contractors in Dayton use a multi-step process, you can choose the level of sheen you want, from matte all the way to a high-gloss finish. Concrete stains can also be used for vibrant colors, earth-toned mottled effects, and custom patterns. As one of the premier concrete polishing companies in Dayton, we can do it all and deliver beautiful, durable polished concrete floors that impress. Here are just some of the benefits to consider with a polished concrete floor. Affordable. It’s hard to beat polished concrete in terms of cost and longevity. Concrete polishing turns concrete slabs into finished floors without traditional floor coverings or coatings. 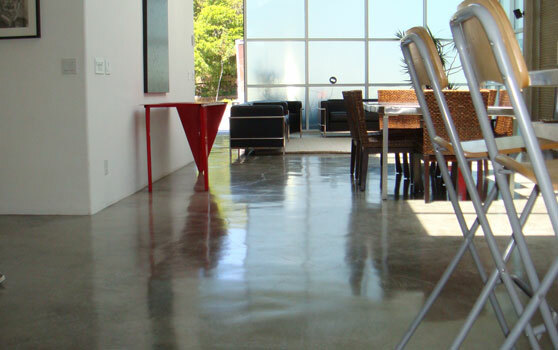 Concrete polishing service is cost-effective and delivers permanent results. Long-lasting. Concrete polishing is a permanent process with results that can last a lifetime. While the concrete will crack over time like all concrete, this can add to the floor’s charm when combined with stains. Low-maintenance. Taking care of polished concrete floors doesn’t require much. The floor doesn’t need to be waxed and it won’t require special products. The concrete will be less porous for reduced risk of stains, moisture issues, and more. Waterproof. You don’t need to worry about flooding, mildew, and other water-related problems with polished concrete. Reflective. Polished concrete floors are highly reflective to increase the brightness of the floor. This can improve safety and even reduce the need for extra lighting. Damage resistant. Polished concrete is incredibly durable. The polishing process makes the surface of the concrete denser to resist stains, heavy loads, chemical damage, and other risks in a commercial space. Customizable. Get any look you want with stained polished concrete floors in Dayton, OH. You can get the look of leather and stone with acid-based stains or vibrant color with water-based stains. We can even incorporate custom patterns and logos. Call for a free quote from Dayton’s Best Epoxy Flooring Company. Epoxy Dayton is professional epoxy flooring company that can help you with your industrial and commercial projects. If you want great results give us a call! We are a third party referral company, all referrals are forwarded to a Epoxy Dayton.